"Let's cut everything but our ever-burgeoning War Department and let Ayn Rand sort it out" is not a serious proposal. It's a religious slogan. The fact that some people are serious about Dead Carpenters, UFOs, or two-bit novelists has nothing to do with whether the ideas themselves are serious. It's like being forced into having a never-ending debate about the real powers of vampires. There's much more on his blog of course. But why isn't this obvious statement of fact being shouted from the roof-tops of the general media? Instead we get endless loops of Ryan looking Young Republican Serious, and Ms Bachmann with her airline attendant bizarro hand gestures--and as Mr. Riley points out--Ms Bachmann is ON THE GOVERNMENT PAYROLL! Sometimes, however, reality does poke it's nose under the tent. The election in Wisconsin just past would suggest that the general population is actually somewhat aware of what the hell is going on--namely, a state-by-state putsch designed by the Kochs and other plutocrats who seem to think this is their decisive moment to act. We all owe Wisconsin voters a debt of gratitude, and we all had better get ourselves to the polls while such an exercise still remains an option in the US. There will be elections for a while yet, and that means there's time to return to some measure of sanity. That would include raising taxes to get the budget more in order, and winding down our military diplomacy to some degree. But we have to elect sane people to do anything sane--that's where things are at. And I have to say, a second "victory" might be the end of the Glenn Beck teevee show. What that means isn't clear. Since he was failing as a Fox cash generator, that might be the whole deal there. One would hope the fact that he was spewing reckless apocalyptic nonsense every live long day also played a small part in the decision-making process. 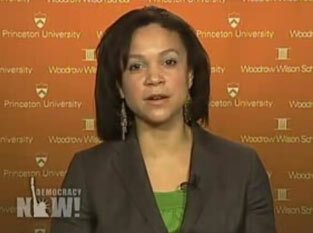 Maybe Mrs Harris-Perry will get her shot on the teevee. She's got some very interesting things to say. Till then you can catch bits of her thinking on Maddow. Update: While I agree with Laurie in the comments that it should have been a landslide in Wisconsin, it's also true that Prosser was way way ahead, and an eleven-year incumbent who had no thought of losing until Governor Walker's big union-busting moves. Also, the voter turnout in Wisconsin set records. So... I'd say on the whole there was at least a wake-up call given to politicians supporting this extreme right-wing agenda. It's also very early, and we are in a very deep hole. Update the Second (Friday morning): Obviously we're all running along behind the news at this point--the fog is much thicker that we thought. The strange discovery of 14 thousand ballots transforms Wisconsin into Florida circa 2000. How very sad. things in wisconsin were a lot closer than i had thought. it should be a landslide.